Pours a clear deep amber or pale reddish brown producing 1.5 fingers of somewhat lasting, frothy, tan head that leaves strings & motes of lace. A second pour after warming produces a full 3+ fingers of moderately lasting head that leaves a chunky wash of webby, streaky lace. Aroma caramel malt, pine resin & citrus, toffee, a candied fruit note of pineapple & apple, floral hints with more than a hint of alcohol. Taste is dark malt, brown sugar, caramel, raisin & alcohol booziness, tropical fruits, orange & leafy floral hops. Some grass & pine. Sweet throughout the sip but with an alcohol bitter finish & spice which linger in the aftertaste & there become increasingly drier, hoppy & bitter. Mouthfeel is heavy bodied with low-moderate carbonation, syrupy, chewy, wet, juicy,with a spicy prickle throughout, drying & drawing in the aftertaste. As the Spring season invites the best of both beer worlds: A fresh hoppy taste that welcomes warmer weather, but a hearty malt backbone and a strong-arm of alcohol to contend with those chilly evenings; it seems that the American Barleywine straddles that fence as well as any beer can. And Lagunitas' Old Gnarleywine kicks off with a deep but brilliant amber glow. Its creamy khaki head unloads upon the nose both the juicy caramelized malts and the dry citrus hops that overwhelm the senses with superior balance. And its first sip resonates with sweeter caramel, toffee and honey just ahead of the hop onslaught to come. Sharp white grapefruit, deeply resinous pine and finesse orange, herb and grass gain brevity and slowly but surely begin to balance the malty-sweet taste. Where one finds balance, the other finds conflict as the bigness of both malt and hops go beyond what's expected in complement and begin to fight each other. Yet, its full and malty-dry body struggle deeper and deeper in finish, the sweetness is able to scrub out the tinny, briny and piquant character of hops. With extensions of citrus peel and crushed pinecone, the beer lingers on and on, begging for a pairing of the sharpest blue cheese possible. Overall: Lagunitas has absolutely perfected the art of producing simple and straightforward yet extremely tasty beers, and this is another example of that. Its not going to blow your mind, but its a very tasty barleywine. And for under $5, this is yet another Lagunitas offering that would be perfect for that go-to seasonal. Cheers! 2015 vintage. 22oz bottle poured into a snifter. Pours copper with a fluffy khaki head that leaves nice lacing and retention. The aromas are pretty tropical. Tons of pineapple. This has a great hop profile, but it's not Lagunitas' traditional hop profile. Feels like I'm picking up galaxy hops. Sweet candy malts are there, but the hops still shine. The flavors are bittersweet. More tropical notes with a touch of citrus. Pineapple is the star, followed by grapefruit. Subtle hints of pine needles. Some sweet caramel. Some raisins and dark fruits. Once again, the malts are there, but the hops shine. Bitterness is there. Some heat, but not boozy. It's just a nice warmth in the finish. Slightly syrupy and spicy. Mouthfeel is on the lighter side of full-bodied. Somewhat thin, but it's still fluffy. Active carbonation. Very smooth and easy to drink. Clean brew. Well crafted. It's great to see this one back on shelves. It's a hoppy barleywine that borderlines being a DIPA, but what else would you expect from Lagunitas? They still stay true to style. Recommended. Beautiful looking red-hued beer with big, creamy head. This is like Lagunitas' take on SN Bigfoot, just with less hop bite and a little more of a candied flavor. Nice creamy/slick mouthfeel with a moderately long finish. Not terribly complex, but wayyy drinkable (read: dangerous). Pours clear deep ruby/ light brown body. Nice lacing, medium-rich appearance. Nose is nicely sweet malts, and background alcohol. Taste is tea-like malt flavor, somewhat spicey, with no hip presence, yet tasty for what shows up. Feels medium-thick, with medium-low carbonation. It wasn’t typical of other good barleywines I’ve had. For example(s), it lacks the hop presence of Bigfoot. It lacks the vanilla/ caramel notes of Helldorado. BUT, this is good. Barley wine. It’s that, carbonated, well-balanced, malts, black tea taste (think how DFH 90 minute malts taste), and for sweetness a touch of honey, and an equal touch of light non-descript spice/ mild bitterness for the finish. The alcohol stays throughout, but it’s more subdued in taste than in smell. It comes through like soft pine. I think this is a good creation overall, and it comes from a very good west coast brewery, which makes it no big surprise. Beautiful clear ruby red brew. A hop forward aroma greets the nose, hinting strongly at the high ABV as well. Syrupy sweet on the palate, accompanied by juicy hops. Almost herbal and minty. Slightly syrupy feel, as well, and slightly hot, but ultimately very drinkable - although it's a sipper, for sure. Like Devil Dancer and DFH 120 Minute, I feel this is going to be a very polarizing beer. It's big, sweet, hoppy, and syrupy. I personally enjoyed 8 oz, but can't imagine drinking much more than that. A- deep amber, not much of a head, but I carefully poured to fit into 22 oz. glass (I wasn't planning on a review until I took the first sip). M- this beer is rich, full-bodied and complex Certainly one to sip. O- another solid brew from Lagunitas! Are these guys mad scientists or what? This beer pours a deep shade of copper with brilliant ruby highlights. It is topped with an inch of tan head that leaves minimal lacing. The smell is interesting. It starts sweet with caramel but gives way to some tea and citrus notes. The taste captures everything that was going on in the smell. It begins a little sweet. Some tea and citrus flavors follow, reminiscent of faded hops, in a good way. This is a very solid barleywine. I need to try a fresh bottle to compare. Poured into a Bruery tulip. Ruby red color, pretty clear with some small floaties and small carbonation bubbles that lead to a huge two finger head that is light tan in color and creamy in appearance. Lace is sticking well in a spotted ring pattern. Smell is huge malt sweetness. Red hard candy and caramel and molasses. Surprised there isn't any alcohol detected by my nose. As it has warmed the alcohol is becoming apparent in the nose. Taste is much like the nose. Hard candy, caramel and honey. There is some bitterness to this. I can't believe the hops have survived for over a year, but it is what it is. The mouth is smooth and silky but a bit crisp. Carbonation is round to spritzy. Body is full and the finish is long and wet. Overall I enjoyed this but it is definitely not a heavy hitter. It is though a great Barleywine at a great price. A must if you come across it. Pours 1 finger of beige head. Decent retention with some splattered lace. Color is a copper amber. Aroma: Apricots, peaches, and grapefruit. Bready malts with some caramel flavors. Earthy floral hops. Solid. Taste: The same fruit flavors show. I like it. Then the malts hit, followed by some earthy hops. Mouthfeel: Bitter and creamy. Medium to full bodied with a medium amount of carbonation. Ends sticky. Overall, this was a surprise to me. Very enjoyable. Good price as well. A solid bwine. Definitely worth a try. 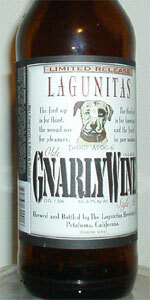 Lagunitas Olde GnarlyWine is sweet, mild, and fruity. It poured a beautiful dark ruby red with no head. It left a crystal-clear glass. The smell and flavor were sweet with a hint of dark fruit that, along with the color, brought black cherry to mind. It had a mild thin feel with a dry finish. GnarlyWine is as close as I've had to an everyday Barleywine. It's delicious, approachable, and has a dirinkability that belies the high ABV. Split a 22oz bomber; poured into a snifter. A: Pours a dark ruby with a heavy head and good lacing. S: Smells of caramel, biscuit and a whole ton of hops. T: Lots of hops here as well. Also, there is a lot of syrupy sweetness in the flavour and aftertaste. D: Alcohol is hidden nicely, but the incredible amount of sweetness in this brew brings down the drinkability. Seriously, if you take a sip and then lick your lips a minute later it tastes like you've been sucking on a hard candy. Overall: I had this one fresh, so the flavours haven't had time to develop yet. That being said, this is still an excellent barleywine. Tasty, affordable, and cellerable! A- Its very dark red, near the upper limit of SRM for the style. I couldn't get head on it to save my life. The little it does have stays there though. S- Immediately hit with a potato chip smell.Like I just opened a bag of Lays. Further inspection gives me some dark cherry smell. If you manage to get some head, you may get some hop smell to overpower it. T- Not nearly as oily as the nose suggested. The immediate taste is full of piny hops and then some sugar. The taste of the nose comes through just barely in the back. It has a nice fruity lingering aftertaste. Very complex. M- Lingers a bit too long, but it has a good amount of stickiness. A little bit of a leather taste is what lingers with the wetness. D- Cannot taste the alcohol. Just a nice fruity piny flavor that is easy to down. VERY solid beer. Poured from a bomber into a perfect. Pours a brilliant clear copper. Three finger head recedes to a light cap. Stick is adequate, carbonation bubbles move slowly through the beer as if it is extremely viscous. Aroma is maple syrup and molasses. Slightly crackery aroma with brown sugar and allspice. Slight hint of dextrose and cream. Finishes with a bit of hop aroma. Flavor is sweet dextrose malt. Brown sugar, molasses and dark fruit. Middle is hop and light metallic flavor. Finishes hot and boozy, alcohol presence is definitely a huge part of this beer. Mouthfeel is lush and soft. Carbonation is small bubbled and creamy. Close to perfect on the tongue. Drinkability takes a hit as the ABV makes this a sipper and the apparent alcohol hotness hinders the drinking a bit. A nice barleywine that brings a different take on the style, like very other I've had. This is a BIG beer and I need to alter some of my scores. Very big caramel and nutty flavor, HUGE malt flavor and the hops are perfectly muted for a BW.